Author: Hildegard Höftmann †, Irmtraud Herms. 8 pp. Roman, 400 pp. Swahili is one of the few African languages that has spread remarkably far beyond its language area of origin – the East African coastal region and its hinterland. Today Swahili – besides Hausa – can be termed the most important African language of sub-Saharan Africa. It is spoken by more than 90 million people either as mother tongue or second language. Since 1967, Swahili is the national language of Tanzania and since 1974 as well of Kenya. In the adjacent states it has emerged as a supranational lingua franca. 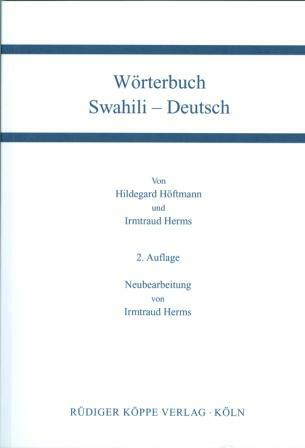 The dispersion into areas where – apart from other Bantu languages – English and French play a role by nature hampered the standardization of Swahili. Particularly the lexis is subject to constant changes; new words are formed, loan words are adopted, others are modified in content and still others are gradually superseded from communication. The basic vocabulary of the present dictionary is based on the correspondent edition of 1989 (VEB Enzyklopädie Leipzig, after that Langenscheidt Munich until 2005). It has been revised with the objective of extending the lexis and its use in phrases, thereby taking into account changes as well as eliminating now rarely or no longer used lexemes. Altogether this dictionary has been supplemented by approximately 2,000 new headwords and about 3,000 additional phrases. Sources for the extension of the lexis were recent dictionaries, word lists and data from state-run Swahili-institutions, modern Swahili texts (fiction, school material, newspapers, journals) as well as spoken texts from radio programmes in Tanzania. The dictionary was conceived of as to facilitate the location of lexemes by listing derivations of primary words with their specific meanings as headwords now. Likewise, predominantly used plural forms are given as separate headwords.